ROCHESTER, N.Y. — Brent Turpyn delivered a walk-off hit as the Hilton Cadets avenged an earlier loss to Brockport with a 5-4 victory in Monroe County League action, Wednesday. Turpyn’s sinking line drive to center field on a full-count pitch scored Dominic Palma from second as Hilton improved to 9-7 on the season with a late-inning rally. 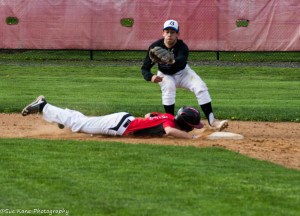 The win evened the series between the divisional rivals with Brockport taking a 13-12 decision in eight innings on April 15th. Brian Wolf nailed down the victory in relief. The senior right-hander entered the game with two on and one out in the sixth inning with Brockport’s top of the order coming to the plate. He surrendered an RBI double to first batter he faced, Michael Jamele, before ending the inning with a punch out. After Jamele’s double gave the Blue Devils a 4-2 lead, Wolf retired five of the last six he faced with only Brockport’s three-hole hitter, Shaye Bartnick, reaching on an intentional base on balls. Hilton starter, John Chiappone, worked out of a pair of two-on, one-out jams in the fourth and fifth innings to keep the Cadets within striking distance. The senior left-hander struck out two and held Brockport to four hits over 5.1 innings. David Stirpe got Hilton on the scoreboard in the fifth inning. The sophomore shortstop plated Chase Metzger and Justin Resseguie with a two-out double to left. Hilton tied the score in the sixth. Jack Annable started the stanza with an infield single when his ground ball to Jamele hit a divot and took a right-hand turn before resting in the Brockport shortstop’s glove. One out later, Michael Murphy walked. Metzger moved the runners with a sacrifice bunt, and Annable scored when Resseguie beat out an infield base hit. Murphy came home on an errant pick off throw to first. Joshua Keenan got Brockport on the scoreboard in the first inning with an RBI single through the right side of the infield. Austin Perry made it 3-0 in the third with an RBI sacrifice fly. Quinlan Ignaszak started and tossed four shutout innings for Brockport before leaving the game after 5.1 innings pitched. Brockport falls to 10-5. The Blue Devils have scored in double figures in eight games this season. The Blue Devils travel to Penfield on Thursday.